Recently, while teaching a class on residential electrical requirements, I opened the class up to the participants to decide which subject matter we would discuss. One of the quicker thinking attendees shouted out, “Can we take a look at the electrical requirements for air-conditioning equipment?” Without missing a beat, I replied, “Sure, find the nameplate on the equipment and comply with the information…next subject!” While it is not quite as simple as that, the nameplate on heating, ventilation, and air conditioning (HVAC) equipment can supply a vast amount of information concerning the electrical needs of such equipment. Understanding the information on equipment nameplates is essential to properly evaluating an air conditioner or heat pump installation. This understanding simplifies the selection of the correct branch-circuit conductor size, the type and rating of the overcurrent protection device, and the size of the disconnecting means. To find most of the necessary information, look on the data plate of the unit. Air-conditioning and heat pump equipment typically have a hermetic motor-compressor and are not treated the same as a conventional electric motor. The hermetic motor operates in a refrigerant environment and does not have a horsepower or full-load current rating such as a standard motor. Special terms are used to provide the necessary information to install wiring properly for this equipment. 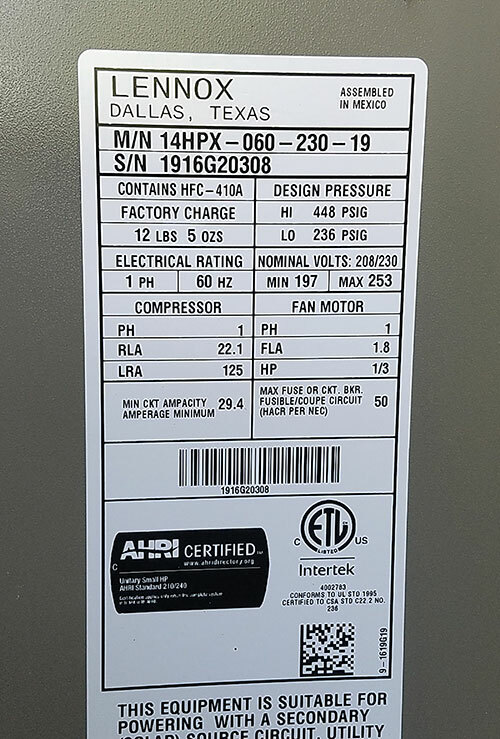 One of the terms noted on a typical HVAC nameplate is Compressor R.L.A., which is the rated-load in amperes or rated-load current for the motor-compressor. The manufacturer establishes this value for a given load, rated voltage, and rated frequency of the equipment it serves. To calculate the minimum circuit ampacity and overcurrent protective device ratings specified on the nameplate, the rated-load current is used. An example of the Compressor RLA might be 18.0 amperes (see figure 1). Another term noted on a typical HVAC nameplate is Compressor L.R.A., which represents locked rotor amperes or locked rotor current and is the maximum current flowing to the motor when it is locked or is not turning. This value ensures that the air conditioner disconnecting means and controller have proper interrupting capacities. 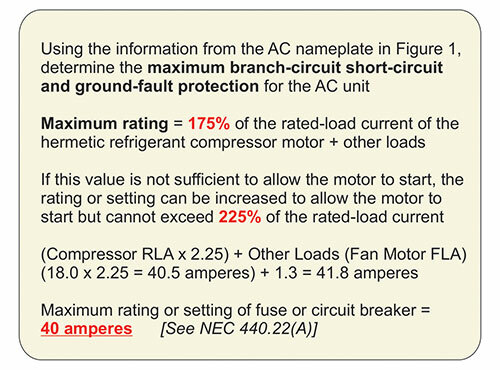 In the example given in figure 1, the LRA for the compressor is 96 amperes. Another term found on the nameplate is Minimum Supply Circuit Ampacity. This value is required to select minimum branch-circuit conductor size and switch ratings for the HVAC unit. To determine the minimum supply circuit ampacity on the nameplate, the manufacturer will use the formula of (RLA x 1.25) + Other Loads. The RLA is based on the compressor load while the “other loads” would be such things as fan motor loads, etc. Maximum Fuse or Circuit Breaker Size indicates the maximum fuse or circuit breaker size permitted to protect the equipment. The manufacturer selects this value based on the rating that permits the motor to start and provides overcurrent protection at the smallest rating for starting the motor. Some nameplates will also provide a Minium Fuse or Circit Breaker rating. These minimum ratings are optional and do not appear on all nameplates. To calculate the maximum overcurrent protection permitted, the manufacturer used the rated load amperes (RLA). Later on in this article, we will use the information from the nameplate example in figure 1 to do a sample calculation of the maximum overcurrent device for an HVAC unit. Sometimes, equipment has a Branch-Circuit Selection Current (BCSC). This value is used (in amperes) instead of the rated-load current for determining ratings of motor branch-circuit conductors, disconnecting means, controllers, and branch-circuit short-circuit and ground-fault protective devices whenever the running overload protective device permits a sustained current greater than the rated load current. The branch-circuit selection current is equal to or larger than the marked rated-load current. Where required, both current values will be on the nameplate. Since the sample air-conditioning nameplate data in this article does not include a branch-circuit selection circuit, the rate load current (RLA) is used for the calculations. See NEC 440.2 and 440.4(C) for a definition of branch-circuit selection current and requirements for same. Currently, manufactured circuit breakers specifically for HVAC equipment are not required to be “HACR” rated, which indicates the circuit breaker is suitable for use with the group motor installations typically found in heating, air conditioning and refrigeration equipment. This HACR marking requirement has not been part of the Code since the 2005 edition of the NEC. Listed inverse time circuit breakers are designed and considered suitable for use with such HVAC equipment without any further testing; therefore, the HACR marking is no longer required on air conditioning and refrigeration equipment or on circuit breakers for use in these applications. The Code does require compliance with nameplate markings. If the nameplate specifies fuses only, substitution of a listed circuit breaker is a violation of NEC 110.3(B) and the manufacturer’s warranties. The manufacturer usually offers a choice of either fuses or circuit breakers. Always check the nameplate information to make sure this is true. The value of rated-load current or minimum circuit ampacity is the starting point for calculating the required ampacity of branch-circuit conductors and rating of electrical equipment for a hermetic refrigerant motor-compressor. Rated load current is determined by the manufacturer and marked on the nameplate of the unit. This value is necessary to determine the rating or ampacity of the disconnecting means, the branch-circuit conductors, the controller, branch circuit short-circuit and ground-fault protection, and the separate motor overload protection [NEC 440.4(B), 440.35]. A typical air-conditioning unit or heat pump outdoor unit with a motor-compressor and additional load(s), such as a fan motor, must have conductors that have an ampacity not less than 125% of either the rated-load or branch-circuit selection current, whichever is larger, plus the full-load current of the fan motor. To calculate the value, we will use the example nameplate in figure 1. This value, rounded up to 24 amperes, is the Minimum Supply Circuit Ampacity stated on the nameplate and is the required minimum ampacity of the branch-circuit conductors selected from NEC Table 310.15(B)(16). Since the equipment nameplate includes this value, it is not necessary for the installer or inspector to perform this calculation. The allowable ampacity of a 12 AWG Type TW, THW or THWN copper conductor is 25 amperes where operated in an ambient temperature not exceeding 86°F. Where installed in temperatures in excess of 86°F, the ampacity correction factors listed in the conductor allowable ampacity tables from NEC Table 310.15(B)(2)(a) must be applied. The Code generally limits the overcurrent protection of a 12 AWG conductor to 20 amperes, unless otherwise specifically permitted. NEC 240.4(G) and Table 240.4(G) permit air-conditioning circuit conductors to be protected in accord with Parts III and VI of Article 440. NEC 440.21 specifically states that the provisions of Part III add to or amend the general requirements for overcurrent in Article 240. For example, the air conditioner nameplate marking indicates a maximum fuse or circuit breaker size of 40 amperes. 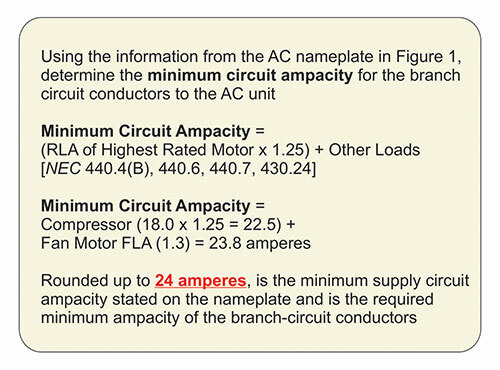 The minimum supply circuit ampacity is 24 amperes. Consequently, if no adjustment for ambient temperature higher than 86°F is required, all 12 AWG conductors having an allowable ampacity of 25 amperes are acceptable as the branch-circuit conductors supply this unit. This rule includes 12 AWG copper conductors that are part of a cable assembly, such as Type NM or UF, which have an allowable ampacity of 25 amperes at 60⁰C. The allowance of a 40-ampere overcurrent protection device for 12 AWG copper conductors with an ampacity of 25 amperes is permitted as a 40-ampere fuse or circuit breaker at the origination of the circuit protects the conductors from a short circuit or a ground fault. A short-circuit or line-to-line fault is where the ungrounded (hot) conductors fault together. A ground fault is where the ungrounded (hot) conductor(s) fault to the equipment grounding conductor or grounded equipment. The conductors are protected from overload by the running overcurrent device. The overload device may be a separate device from the overcurrent protection device. A thermal element built into a motor controller is one type of overload. The overload for a hermetic motor-compressor is usually contained in the motor housing and directly senses motor temperature. The combination of the two elements provides the overcurrent protection necessary for the safe and proper operation of motor-operated equipment. The Code requires the branch-circuit overcurrent protection to be capable of carrying the starting current of the motor. The maximum rating is 175% of the rated-load current of the hermetic refrigerant compressor motor. If this value is not sufficient to allow the motor to start, the rating or setting can be increased to allow it to start but cannot exceed 225% of the rated-load current [See NEC 440.22(A)]. If this calculated value is not a standard current rating [see NEC Table 240.6(A)] of an overcurrent protective device, the Code requires use of the next lower standard rating. In this example, the next lower standard device is 40 amperes, as stated on the figure 1 sample nameplate. It is not necessary to perform this calculation in the field. The manufacturers of the AC unit or heat pump calculate the value and determine the maximum rating. This rating is provided on the unit’s nameplate. A lower rating protective device is permitted if the fuse or circuit breaker is capable of carrying the starting current of the unit. If the nameplate includes a “Minimum Fuse or Circuit Breaker Size,” then the Code would also require compliance with that marking, in addition to the marking of the “Maximum Fuse or Circuit Breaker Size.” A fuse or circuit breaker rated lower than the minimum value marked on the nameplate will not be capable of carrying the starting current of the unit as determined by the manufacturer. Where the air-conditioning or heat pump compressor unit consists of a hermetic refrigerant motor-compressor(s) in combination with other loads, such as the fan motor, the horsepower rating of the disconnecting means is based on the summation of all currents at rated-load condition and locked-rotor condition. Using the nameplate information from figure 1, the 18.0-ampere RLA of the compressor motor is added to the 1.3-ampere FLA of the fan motor. The total of 19.3 amperes is then considered to be the equivalent full-load current for the combined load. According to NEC Table 430.248, the full-load current rating of a 230-volt, single-phase, 3-horsepower motor is 17 amperes, while the full-load current of a 230-volt, single-phase, 5 horsepower motor is 28 amperes. Consequently, since the equivalent full-load current of the example AC unit is 19.3 amperes, we must use the next higher rating, and the disconnect switch must have a minimum of a 5-horsepower, 230-volt, single-phase rating. The provisions of NEC 440.12(A)(1) generally require the ampere rating of the disconnecting means must also be at least 115% of the sum of all currents at rated-load condition. This minimum rating would then be 115% x 19.2 amperes = 22.3 amperes. If the disconnecting means includes or serves as the branch-circuit overcurrent protection for the unit, the rating required for the overcurrent device, rather than this minimum rating, would be the determining factor in sizing the disconnecting means. A fused disconnect switch containing either the maximum or minimum sizes of fuses listed on the nameplate would exceed this 115% minimum requirement. However, if an unfused disconnect switch is used as the disconnecting means, then the larger of the two values obtained by the 115% calculation and the equivalent horsepower rating would establish the minimum switch rating. 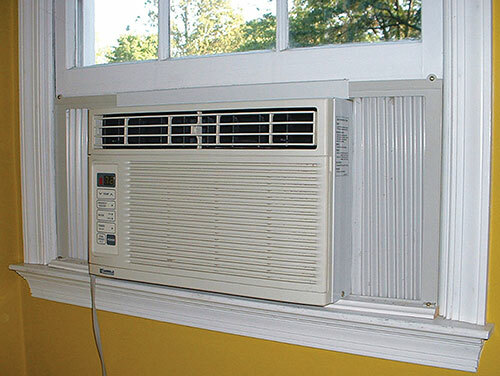 There is another consideration in establishing the correct size of the disconnecting means serving the air-conditioning unit. The disconnecting means rating must also be based on currents at locked-rotor condition in compliance with 440.12 (B). This calls for reference to NEC Table 430.251(A) or Table 430.251(B), which list various values of locked-rotor currents and an equivalent horsepower ratings. In our example at figure 1, the nameplate indicates that the motor-compressor LRA is 96 amperes. The nameplate does not give a LRA for the fan motor. A typical assumption for AC motors is to suppose the LRA is six times the FLA. For the fan motor in the example, this gives an approximate value for LRC of 6 x 1.3 amperes = 7.8 amperes. Adding this to the motor-compressor LRA of 96 amperes gives us an equivalent LRA for the combined load of 103.8 amperes. Referring to NEC Table 430.251(A), we find that for a single-phase, 230-volt motor with a 103.8 amperes motor locked-rotor current, the equivalent horsepower rating falls between 3 and 5 horsepower. A 3-horsepower disconnect switch would be slightly undersized. The disconnecting means for the unit should be based on a 5-horsepower rating as was determined using the full-load current rating. A disconnecting means is required to be located “within sight from and readily accessible” from the air-conditioning equipment. Therefore, the following two definitions must be clearly understood. This disconnecting means can be installed on or within the air-conditioning equipment itself. A disconnecting means that is field-mounted directly on the equipment must be mounted in a manner that will not restrict access through panels designed to allow service and repair operations and access to the components inside the unit. In addition, this field-mounted disconnecting means must not obscure the equipment nameplate(s). Typically, an air conditioner or heat pump compressor is located on a concrete pad outside the dwelling or structure. It may also be located under the building in a properly ventilated crawl space or it is quite common for HVAC equipment to be mounted on a rooftop. It is important to remember that the definitions of within sight and readily accessible have a significant meaning in these applications. It is not unusual for the disconnecting means to be located next to the air-conditioning unit and is, therefore, considered as being readily accessible (with proper working clearances). Access to the disconnecting means may be restricted if it is located above or behind the unit. If the disconnecting means is likely to require examination, adjustment, servicing, or maintenance while energized (and it will), sufficient working space should be provided. The proper location of the disconnecting means is subject to the judgment of NEC 110.26(A) and judgment of the authority having jurisdiction (AHJ). The purpose of the required disconnecting means is to provide a ready and visible means of disconnection for the person who will service or repair the equipment. Typically, a locking type of disconnecting means located out of sight from the unit is not an acceptable alternative for the required disconnecting means for air-conditioning equipment. 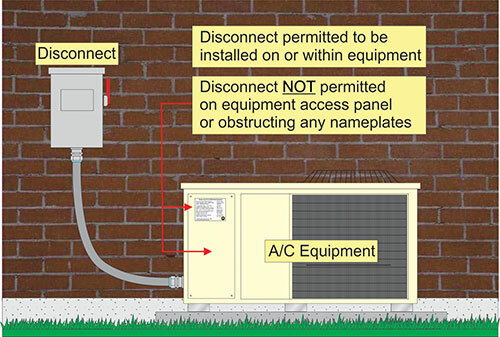 The provisions for the proper location of HVAC disconnection means can be found at NEC 440.14. An attachment plug and recptacle combination is considered an acceptable disconnecting means for most cord- and plug-connected equipment, such as room air conditioners. 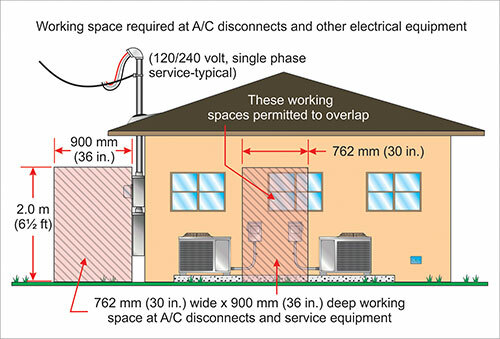 Working space about electrical equipment rated 1000 volts or less, such as an AC unit disconnect, that is likely to “require examination, adjustment, servicing, or maintenance while energized” must be provided in accordance with NEC Table 110.26(A). The working clearance must be in the direction of access to the equipment, or the part of the equipment, that is likely to be worked on while there are live, exposed parts. It is common for service persons to examine or test HVAC equipment while it is energized. Safe access must be provided to the control equipment within the unit. The minimum dimensions of this working space are 762 mm (30 in.) wide and 900 mm (36 in.) deep. Compliance with this working space rule requires the provision of safe access at the time the equipment is being installed. Adequate working space must also be provided in front of removable panels that give access to the live parts AC equipment that are typically required to be tested or examined; this space is to be accessible without requiring the worker to stretch across or lie on the AC unit itself to achieve this examination. In addition to adequate working space, service personnel often require power for portable electrical tools and equipment associated with servicing air-conditioning equipment. Recognizing this need, the Code stipulates that a 125-volt, 15- and 20-ampere receptacle for servicing air-conditioning and refrigeration equipment is to be located not less than 7.5 m (25 ft) from, and on the same level as, the equipment itself. 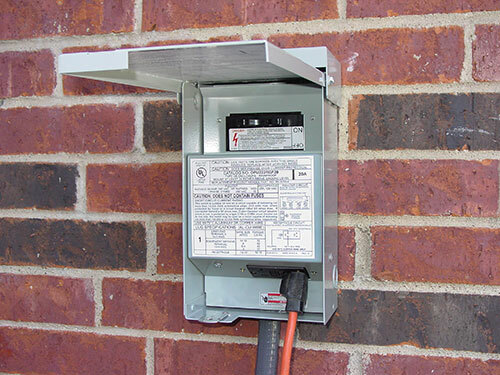 The receptacle must be in a readily accessible location from the equipment and must be GFCI-protected as applicable to outdoor receptacles at dwelling occupancies (NEC 210.63). Some electrical equipment manufacturers have combined the required disconnecting means and service receptacle into one product. Separate circuits for the receptacle and the compressor unit are required. The service receptacle should be a weather-resistant, GFCI-protected device, and the extra duty-rated in-use cover of the unit should comply with the requirements of NEC 406.9(B)(1) for use in wet locations. Per the manufacturer’s specifications, there is typically a minimum mounting height for this product to prevent snow or water from entering the opening in the bottom of the hinged cover. A heat pump transfers thermal energy from one location—typically called the “source,” which is at a lower temperature—to another location called the “sink” or “heat sink,” which is at a higher temperature. A heat pump always moves thermal energy in the opposite direction from temperature, but a heat pump that maintains a thermally-conditioned space can be used to provide either heating or cooling, depending upon whether the environment is cooler or warmer than the conditioned space. In heating mode, the outdoor coil becomes the evaporator, while the indoor coil becomes the condenser which absorbs the heat from the refrigerant and dissipates to the air flowing through it. In the cooling mode, the outdoor coil is now the condenser. The indoor coil, now the evaporator, is going to absorb the heat from inside the enclosed space and take it to the condenser, which ejects the heat into the outside air. With heat pump split systems, an indoor air-handling unit is installed. Refrigerant lines run from the outdoor unit to the indoor unit, which typically is in the crawl space, attic or a utility closet or room. The indoor unit includes a fan for circulating air through the dwelling as well as the refrigeration coil. Resistance heating elements are sometimes added to the indoor unit to serve as backup heat in case of compressor failure, to provide extra heating capacity, and to promote faster heating recovery. Many of the same rules apply to indoor units as apply to electric furnaces. A disconnecting means rated for the load to be served is required within sight of the indoor unit. In some cases, this disconnecting means consists of one or more circuit breakers that are in the unit and are operational from outside the unit. The minimum size of the branch circuit to the indoor unit is required to be not less than 125% of the resistance heat and motor load. A room air conditioner is an alternating-current appliance that incorporates a hermetic motor-compressor. The room air conditioner may be of the air-cooled window, freestanding console, or in-wall type. The following requirements cover equipment rated not over 250 volts, single-phase; such equipment may be cord- and plug-connected. In determining branch-circuit requirements for a room air conditioner, a cord- and attachment-plug-connected unit is considered as a single motor unit if the rating is not more than 40 amperes, 250 volts, single-phase. Also, the total rated-load current is shown on the air conditioner nameplate, and the rating of the branch-circuit protective device cannot exceed the ampacity of the branch-circuit conductors or rating of the receptacle, whichever is less. The total marked rating of a cord- and attachment-plug-connected room air conditioner shall not exceed 80% of the branch-circuit rating where no other loads are supplied. If the branch circuit also supplies lighting units or other appliances, the rating of the unit cannot exceed 50% of the rating of the branch circuit as indicated at NEC 440.62. Where a flexible cord is used to supply a room air conditioner, the length of the cord cannot exceed 1.3 m (10 ft) in length for a nominal, 120-volt rated unit or no more than 1.8 m (6 ft) length for a 208- or 240-volt rated unit as addressed at NEC 440.64. The protective device shall be an integral part of the attachment plug or be located in the power supply cord within 300 mm (12 in.) of the attachment plug. Single-phase room air conditioners are now required to be provided with one of three factory-installed protective devices: (1) leakage-current detector-interrupter (LCDI), (2) arc-fault circuit-interruption (AFCI) protection, or (3) heat detecting circuit interrupter (HDCI) protection. These protection devices are only required for cord- and plug-connected units. These protective devices must be factory-installed and either be an integral part of the attachment plug or be located in the power supply cord within 300 mm (12 in.) of the attachment plug. 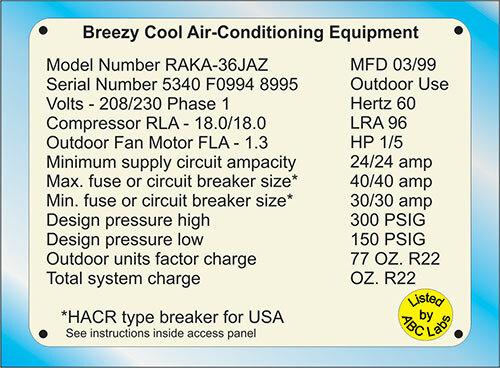 These room air conditioner protection provisions are covered at NEC 440.65. This protection requirement is intended to protect against hazards caused by damaged or broken cord insulation. Seasonal use of room air conditioners promotes cord damage unless the unit is stored properly. For room air conditioners, the nameplate is marked to show the type and maximum size overcurrent protection permitted for the unit. Previous comments about use of fuses or HACR circuit breakers apply to room or window units as well as to central air conditioners and heat pumps. Where a room air conditioner is added to an existing dwelling and supplied from an existing panelboard or load center, it is important to verify the branch-circuit overcurrent device for the circuit supplying the air conditioner complies with the type and size overcurrent protection stated on the unit’s nameplate. This standard covers stationary equipment for use in nonhazardous locations rated 7200 volts or less, single- or 3-phase, and remote control assemblies for such equipment as central heating, central air-conditioning, and heat pumps. This standard does not cover panel or cable type radiant heating equipment, electric boilers, baseboard heaters, air heaters, duct heaters, and unit coolers for refrigeration purposes. This standard covers room air conditioners rated not more than 600 volts alternating current (ac) and intended for installation in accordance with the NEC. For the purposes of this standard, room air conditioners include packaged terminal air conditioners, special purpose air conditioners, and recreational vehicle air conditioners. They are factory-made encased assemblies designed as a unit primarily to provide free delivery of conditioned air to an enclosed space, room, or zone. This equipment is intended for installation in a window, through a wall, or as a console located in or adjacent to the room, zone, or space to be conditioned. 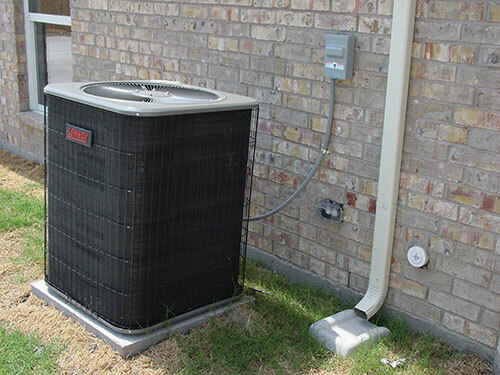 This standard does not cover equipment intended for connection to duct systems for the purpose of providing central cooling, heating, or both. These product safety standards detail the necessary safety tests and determine the required nameplate markings and instructions that are included by the manufacturer of the equipment. For example, the Code requires that the branch-circuit overcurrent protective device correspond with the type and size specified on the air-conditioner nameplate. Consult the following electrical product safety guide card information and product safety standards for additional guidance on the proper installation, operation, and use of electrical equipment covered in this article. The four-letter code in parentheses refers to the product category in the Underwriters Laboratories’ UL Product Spec (White Book). Next articleWhat makes IAEI Magazine a great publication? The “Air Conditioning Equipment” article is superb!! I have copied all my associates (most are IAEI members) with the IAEI article.